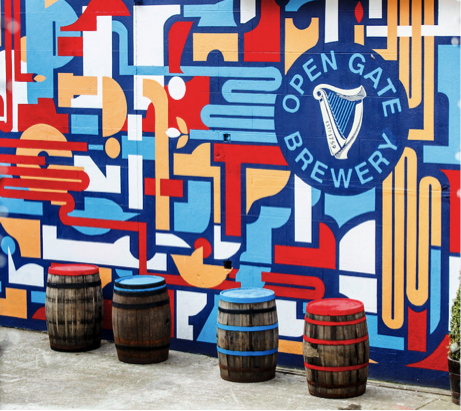 Guinness is opening a pop-up taproom for its Dublin-based Open Gate Brewery just off Brick Lane, at 11 Dray Walk, part of the Old Truman Brewery site. Open from 30th November to 22nd December, Wednesdays to Sundays, visitors can try some of the Open Gate beers, including the American West-Coast style Citra IPA, plus special winter brews, and you can even book workshops to learn more about brewing (an ideal early Christmas presents, maybe?). Looking forward to visiting this one! "This November Open Gate Brewery launches an Experimental Taproom in London, bringing a taste of our innovative beers dreamed up at the iconic Guinness Open Gate Brewery in St James Gate, Dublin. Popping-up for one-month, the taproom invites beer lovers to enjoy a pint of Open Gate Brewery’s exciting beers including American West-Coast style Citra IPA and hopped, crisp and clean tasting Pilsner, alongside a range of exclusive and special brews, including a chilli-flavoured stout and festive Christmas beer. There has been an experimental brewery at St James’s Gate in Dublin for over a hundred years and today the Open Gate Brewery enables Guinness brewers to explore new recipes, interpret old ones and experiment freely to bring exciting new beers to life. The beer taps in the brewery are on constant rotation with guests’ feeding back on their favourite pours. Head to the Open Gate Brewery’s Experimental Taproom to find out more and to book a workshop, visit ogbtaproom.eventbrite.co.uk."